Below you can find driving directions from Google Maps to help you get from Coral Springs to your nearest Fix Apple Now store, situated in Weston. You can either copy the driving instructions below or click here for a larger map and driving directions. Choose Fix Apple Now if you need to fix, repair, restore, mend or replace your broken iPad, iPhone 4, 5 or 6, Apple Mac, MacBook Air or Pro or iPod. At Fix Apple Now, we have the resources, skill and expertise to deliver the outstanding service you've been looking for, and you can count on our engineers to do everything in their power to bring your beloved Apple device back to life. More and more people are choosing us over the competition all the time thanks the excellence of our services. Talk to Fix Apple Now if you have an unresponsive touchscreen, your iPhone 6 won't charge, you have a landscape keyboard you can't get rid of, “no SIM card” error messages, a red screen, overheating iPhone, crashing music apps or can't see an incoming call screen when people try to contact you. We can fix your device quickly so you don't have to be without it for more than a few days. 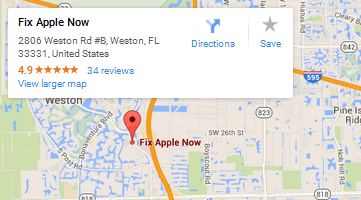 We're here for you if you need to fix your iPhone in Coral Springs.